If a student cancels within 24 hours of registration for class, s/he is entitled to a 100% refund. After the 24 hour period and registration and payment are made, the fee is non-refundable. If a student registers for a class the same day within a 24 hour period of the class, all payments are final and non-refundable. To receive a refund, provide written notice to WorldCPR Learning Centers, LLC (email us at training@worldcpr.com) at least 24 hours prior to the day of class. Full refunds will be given for medical excuses with a doctor’s note. Refunds are subject to a $10 cancellation fee. Your refund will be issued within 2 – 4 US business days. You will receive an automatic refund receipt via email once your refund has been issued. Once your refund is issued, it typically takes 2-5 US business days (but may take up to 7-10 US business days) to appear on your credit card statement. Emergencies do happen, and in most cases without notice. A class maybe cancelled, due to severe weather, instructor illness/injury, family emergencies or any other circumstances of an emergency. Students registered in a class that was canceled will receive priority enrollment in the next available class. In most cases, WorldCPR will try to get an additional instructor or reschedule a class within a few days. If there are no available classes in 14 days within a 25 miles radius of the class, then WorldCPR will issue a full refund to the student and cancel the registration. Weather related emergencies may occur and WorldCPR does adhere to emergency alerts of the National Weather Service (e.g. Tornado watches, Tornado warnings, Hurricane watches, Hurricane warning, and Snow Emergencies). We are mindful of the safety of our instructors and students so a class may be rescheduled due to weather emergencies. When a class is canceled due to a weather emergency alert per National Weather Service, WorldCPR will reschedule the class within a 14 day period or the student can register with another upcoming WorldCPR class. If a student needs to transfer a registration from one student to another student, it can be done at any time within 24 hours before the class begins. Registered students may transfer that registration to any other person at no additional charge. In order to complete the transfer, please reply to your email class confirmation with the change, or contact us by email, phone or click on the contact us tab on website to update transfer. A student may request to reschedule a class within 24 hours “one time only” to another class with open enrollment availability with no penalty. If canceling the same day to reschedule, it must be done any time “BEFORE” the start of the class. If the class is rescheduled the same day a $5.00 reschedule fee will be applied and billed to the student. The class the student is rescheduling to must be cost-equivalent to the class that is being rescheduled. In the event the class fee is less, the difference is not refunded unless changes are made within the 24 hour registration refund policy. If the class the student is transferring to, fee is higher, the difference will be billed to the student and must be paid before taking the class and or receiving their certification. The student must reschedule to a class that’s within 60 days from their initial registration date. All classes’ rescheduled must be received before the original class date; either by mail, email, or phone. If a student rescheduled a class after the class has started but within the same day, a $10.00 fee will be billed to the student for the reschedule fee. After a student uses their one time reschedule option, the student has the option of a 50% refund from the price of the class, or pay for an additional class at 50% of the cost. Students who need to reschedule their class must provide written notification to WorldCPR Learning Centers, LLC (email us at training@worldcpr.com ). If a student does not show up for the class they registered for, and does not contact WorldCPR following the rescheduling policy before the start of that class or “SAME DAY” of the class, that student is considered a no-show. If a student does not show up or reschedule per the policy, the registration fee is non-refundable. Therefore, the student cannot reschedule another class under that registration. Special exceptions may be considered on a case-by-case basis due to emergencies and other circumstances approved by WorldCPR. 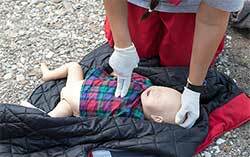 All WorldCPR courses include attendance as a part of the certification process. All students are required to arrive on time to classes. The student must be present for the entire class to receive certification. Please sign up for a class only if you are able to arrive at the scheduled start time and stay until the approximate end time posted on the Schedule & Sign-up page. The required practical skills test and written exam are administered at the end of each course, therefore students may not leave early. Students are required to arrive on time to their registered class. If a student arrives to class (15) minutes after the start of class, the student is consider late. The student may be denied access into the class by the instructor. In some cases, the student may be allowed into the class and allowed to participate, but without certification. If a student arrives late and chooses not to participate, the student must inform to the instructor as well as contact WorldCPR immediately. (Please refer to reschedule policy) Failure to do so, the student will be considered a No-Show. Students coming in for skills check sessions only have a 10-minute grace period from appointment start time. After 10-minutes, students will have to reschedule their skills check session. For the first reschedule of skill check, there is no penalty, but for each reschedule thereafter the student will be billed $10.00. The fee must be paid before the next skill check appointment date. All classes are held at our training facility. WorldCPR can also travel to do group classes. Private group classes can be arranged. Once an instructor has arrived and ready to start, if the organization or client scheduled for the a class holds up, or delays the instructor from starting the training, the organization or client will be charged at a rate of $45/hour, which will be billed in 15 minute increments for delay. The fee will be charged to the organization’s/client’s original payment method submitted to WorldCPR during registration. Certification cards will not be issued until balance and fees are paid in full. There is a 15 min grace period so the fee will not apply until after that time. For students that are new providers or have a BLS for Healthcare Provider card that expired, the student must take the full certification class. If the student has a current, NON-EXPIRED, BLS for Healthcare Provider card, that student is eligible to take the recertification course. If a student needs another copy of their card within their 2 year certification with WorldCPR, the fee for a hard copy of card is $25.00 and printable e-mail or fax copy is $5.00. If the card has expired, we are unable to provide copies of cards; the status of the card has to be current. If a student realizes that their name is spelled incorrectly or needs to be changed on their certification card, please contact WorldCPR right away. If the error is due to WorldCPR there is no fee to make the change BUT the student only has 7 days to notify WorldCPR after the card was received to make the change. After 7 days a fee may be applied. If it is an error of the student, the student has 5 business days from the date they took the class to notify WorldCPR to make correction, no fee will be applied. After 5 business days if a student needs to make a change to the name on the card there is a fee of $15.00 to make the change and correct the card. After 30 days from the certification date, if a name needs to be changed or corrected, the student must provide proof of their name with a copy of their license or state ID, copy of marriage certificate or state document that name was changed; $15.00 will apply. Students are not permitted to bring into class any hazardous material, weapons, drugs, alcohol or anything that is harmful or can endanger the safety of others students, the instructor or themselves. Classes will only be held in a smoke-free environment. There is no eating in class. Students can eat very small snacks or have beverages in the class but full meals are not allowed. Eating in class can be disruptive to other students and the instructor. An instructor can advise a student to stop eating if the instructor concludes it’s distracting to the class environment. If a student has a medical problem in which they need to eat the student is required to advise the instructor before the start of class. If a students is doing something or has something an instructor feels is distracting to the class, the instructor is allowed to advise the student to stop doing or using whatever they see fit that is causing the problem. If a student is generally being disruptive or distracting during a class, the instructor will warn the student first but after a warning the instructor is authorized and allowed to request the student to leave the class. WorldCPR will make the decision on measures to be taken thereafter. If a student is put out of a class, WorldCPR has the right to not refund the fee for the class and not to reschedule the student so please be respectful of other students and the instructor. It is the policy that students receive a hand book before the class. If you already have a hand book that’s great, you can use your book as study material before and during the course. Certification cards will not be released to the customer until their invoice is paid in full. If an organization or a client has a past due balance, their remaining balance will be charged (14) days after the due date to the original payment method submitted by the customer. Outstanding balances that surpass (30) days from the original due date will incur a late fee of $35.00 and $2.00 daily fee each day thereafter 45 days from the original due date. The original payment method will be billed every (14) days until full payment is received or up until 90 days from the original due date if payment has not been received by WorldCPR. After 90 days, WorldCPR will forward the outstanding invoice to collections for legal processing in which motions will be filled against the organization, client or customer for not following the terms and conditions of the agreement for outstanding balance due to WorldCPR. When a student registers and completes payment for a class, the student has 24 hours from the transaction date to cancel registration and receive a full refund. Registrations completed, after 24 hours from the date/time of the transaction, the registration and payment is finial and non-refundable. If the student is registering for a class that is scheduled the same day or next day, the registration and payment is final and no refunds are granted. 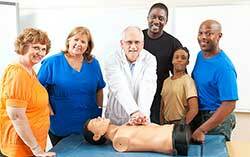 WorldCPR Learning Centers offer discounts, promotions, or bundling deals. Returning students enjoy 5% discount and there is a 5% discount on all group trainings. Please be at least 14 years old to take classes at WorldCPR. WorldCPR is located in a building that currently is easily accessible. We are committed to protecting and safeguarding your privacy. The information we collect about you when you visit our site is private and will not be shared or sold to any other company or person not directly affiliated with WorldCPR Learning Centers, LLC.